Name of booth: E Yuki Seikatsu Co., Ltd.
We deal with a large amount of processed food products using local raw ingredients without any chemical seasonings. Please drop by our booth for food sampling! Feature: As carrot pulp is used, you can taste a different texture when drinking the juice. 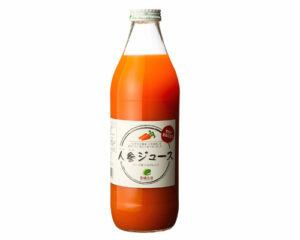 The carrots used are produced in Japan and does not contain any chemical pesticides and fertilizers, and is mixed with straight apple juice produced locally. We also use locally-produced lemon juice and plum extract so the aftertaste is refreshing, so it is popular even among people who dislike carrots. The sweetness comes from the natural sweetness of the carrots and apples; no added sugar nor additives are used. Feature: This ginger syrup is made from extract from organic ginger cultivated in Chiba prefecture, locally-produced lemon juice and crude sugar. 1 bottle has approximately 84g of ginger in it, making it spicy. 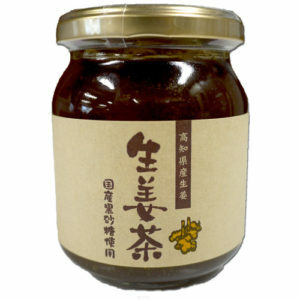 The sweetness of the syrup comes from Kagoshima-produced crude sugar from sugar cane. 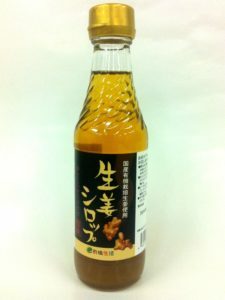 – it is a 100% Japan-produced ginger syrup. During summer you can produce homemade Ginger ale using ice and soda water. Please dilute it 4-5 times. During winter, you can make ginger soup or ginger red tea, and ginger milk tea using milk etc. Feature: Using the ‘golden’ ginger from Kochi prefecture, Shimanto, it’s double the spiciness, and three times the aroma of the usual ginger. About 25% of the “golden” ginger, together with maltose, processed brown sugar, fructose are used to produce the sweetness. The refreshing spiciness and the mild sweetness is healing to the body. Depending on your preference, you can add the amount of ginger syrup you like and make it either a iced or hot drink, for coffee, tea, yogurt or bread etc. Feature: Using the ‘golden’ ginger from Kochi Prefecture, the sweetness is reduced, with added Nankou plum from Wakayama to achieve a Japanese-tasting plum ginger tea. Please enjoy the moderate sour taste of rhe plum, and the pleasant, refreshing ginger taste as it runs down your throat. Of course you can drink it with hot water, but as the thickener used in the product is made from gelatin, it also dissolves easily in cold water so you can also enjoy it as a chilled drink. 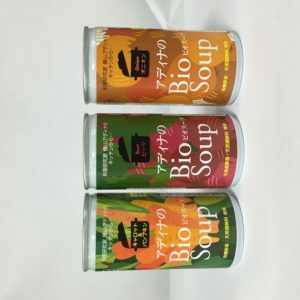 Feature: This is a soup based on Adina Yokoyama’s (food researcher born in Romania and living in Hokkaido) recipe with from Hokkaido organic vegetables, organic olive oil and sea salt only. 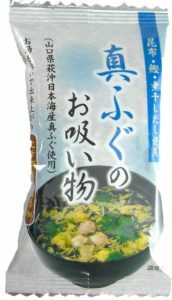 ① The vegetables used are all Hokkaido organic vegetables ② seasoning is only organic olive oil and sea salt ③ the soup is thickened without any starch nor potato starch but only with the vegetables and its fibres. ④It is surprising low-calorie. It is delicious when warm, slighted cooled down, or even chilled. It is certified as organic by JAS. Feature: This product uses blowfish bred naturally from the sea of Yamaguchi Prefecture, Hagioki, referred to as the “Queen of Blowfish”. 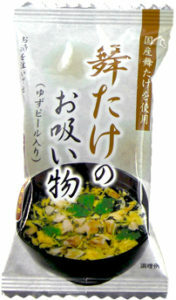 Using konbu, katsuo and dried anchovy, low salt content is achieved at only 0.9g per serving. The preparation method is very simple: add about 180cc of hot water and it is ready. No chemical seasonings nor additives are used. The long storage period is made possible by the freeze-dry process. 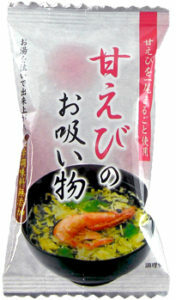 Feature: Using a whole sweet shrimp, together with konbu, katsuo and flying fish dashi, low salt content is achieved. The preparation method is very simple: add about 180cc of hot water and it is ready. You can serve it for dinner in daily life, or as a slightly luxurious item to your customers. No chemical seasonings nor additives are used. The long storage period is made possible by the freeze-dry process. Feature: This is made from Niigata Prefecture’s Maitake mushrooms and locally-produced Yuzu. Using konbu, katsuo and dried anchovy, low salt content is achieved. The preparation method is very simple: add about 180cc of hot water and it is ready. No chemical seasonings nor additives are used. The long storage period is made possible by the freeze-dry process. 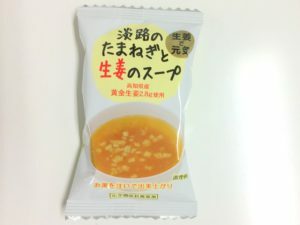 Feature: There is in total 4 packets of 3 types of soup: There is 1 packet of soup using one whole sweet shrimp, 1 packet of soup using Yamaguchi Prefecture’s Hagioki’s blowfish, 2 packets of mushroom soup using locally-produced maitake mushrooms and yuzu. Using konbu, katsuo and dried anchovy, low salt content is achieved. The preparation method is very simple: add about 180cc of hot water and it is ready. No chemical seasonings nor additives are used. The long storage period is made possible by the freeze-dry process. Feature: Awaji Island’s onions, which are sauteed in olive oil to bring our its sweetness, are used in this product. 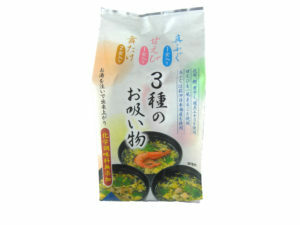 The soup base is not consomme but a new combination of chicken extract+Katsuo+Konbu. The taste is very Japanese, but you can still taste the faint chicken extract. And we think you will taste and exclaim that “The onion is so sweet!”. 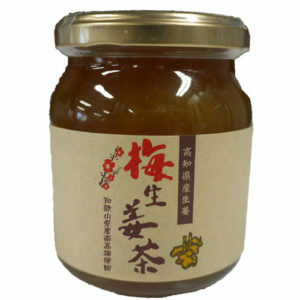 ‘Golden’ ginger from Kochi Prefecture is used, without any chemical seasonings nor additives. ← AAS Catering Co., Ltd.